"Despite how it is often presented abroad, Thai cuisine is not a single entity. From village to village and province to province, flavours, cooking methods and even staples like rice can vary immensely, reflecting the diverse topography of the country and the cultures and traditions of its people. ‘Ancient Roots, Culinary Crossroads: The Food of Northern’, is a photographic exhibition by American writer and photographer Austin Bush. The exhibition brings together images and displays thatintroduce the unique dishes, ingredients, people andcooking techniques of northern Thailand and explore the rich cultural andgeographical roots that have shaped them. 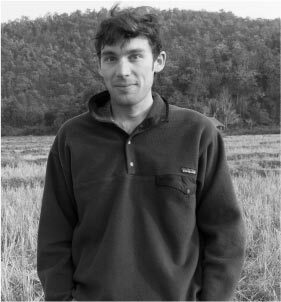 Austin Bush came to Thailand in 1999 as part of a language study programme hosted by Chiang Mai University. It was in this city where he got his first taste of northern Thai food, and he's been hooked ever since. A native of Oregon and a writer and photographer since 2005, Austin has contributed to more than 20 books to Lonely Planet, as well to media outlets including Bon Appétit, Condé Nast Traveler, Saveur, The New York Times, Travel + Leisure Southeast-Asia and VICE, among others. His blog (www.austinbushphotography.com/blog) has been mentioned in numerous media outlets, and in 2013 was a finalist in Saveur magazine’s Best Food Blogs awards. The exhibition’s title, “Ancient Roots” refers to the origins of Northern Thailand’s cuisine, including emblematic home-grown dishes such as laap, a spicy, raw, minced salad laced with dried spices and pungen therbs, and nam phrik, chili-based dips eaten with glutinous sticky rice, a staple of the northern diet. Nam phrik in particular reflect the simplicity of a cuisine of a people who have, since earliest times, subsided on rice agriculture and a diet based around rice, fish vegetables and herbs. 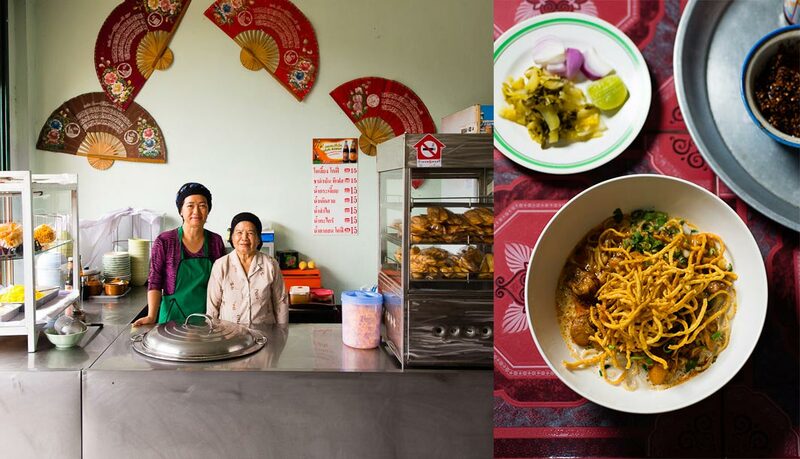 And “Culinary Crossroads” refers to the evolution of dishes that came as a result of this exchange, which include khao soi, a curry noodle soup that ostensibly arrived in Chiang Mai with Jeen Haw (Chinese Muslim) caravan traders in the last century. Chiang Mai’s most famous dish, khao soi represents the epitome of this‘crossroads’ cuisine, Its flavor-packedcurry broth, egg noodles and pickled cabbage condiments offer a heady mix of Burmese, Shan and Chinese Yunnanese influneces in a single dish. “Ancient Roots and Culinary Crossroads” also touches on the more esoteric cuisines of the north, including the unique and little known dishes of the Akha, one of Thailand’s nine officially recognized “hill tribes”, as well as the food of the KMT or Kuomintang, Chinese nationalists who fled Mao’s Red Army at the start of the Communist Revolution to settle in remote villages in Chiang Rai and elsewhere in the north. 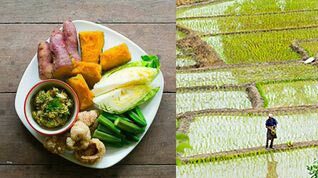 Their pickled vegetables, fermented tofu snacks and high-quality tea, which grows plentifully in the cooler climes of the north, all have a role to play in the rich culinary fabric of the north today. Northern Thailand’s fresh markets remain where many people go for the type of produce found across the country: greens, fresh herbs and fruit. Yet perhaps most unique about the markets of the north is the abundance of items that come from informal, home-bound agriculture. 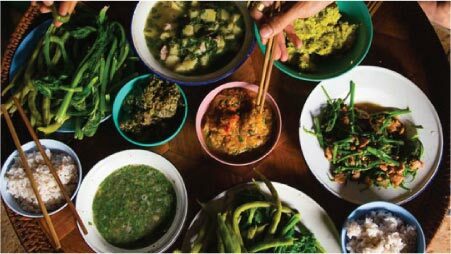 There are more than 40 edible plants indigenous to the region, and a northern Thai home is generally home to a variety of free-growing herbs as well as a few fruit trees – perhaps a couple of jackfruit trees, a pomelo tree and a tamarind tree. Large scale, seasonal agriculture also results in semi-wild crops, such as phakwaen, a seasonal vegetable that thrives in wet rice fields. This has created a type of informal agriculture in which fruits and herbs are not exactly cultivated, but rather are left to thrive and are gathered to supplement meals – and occasionally, income. These home-grown crops often make their way to the region’s markets, sold in the form of a few artistically arranged bundles or piles. A walk through the produce section of a contemporary northern Thai market will also reveal the kind of cold weather, high altitude crops one may not expect to find in Thailand: maize, sorghum, millet, chilies, beans, herbs, manioc, taro and sesame. Such crops are grown by the Hmong and the other so-called “hill tribes” of northern Thailand, who traditionally had no access to the more fertile lowland areas suited for permanent field cultivation. 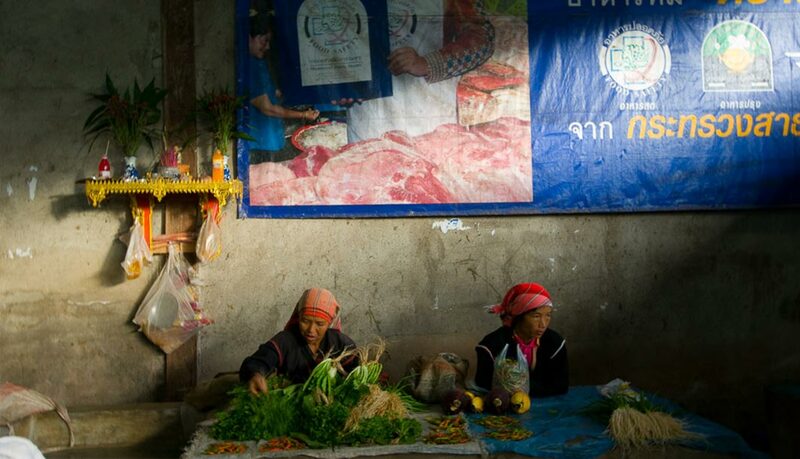 Sold alongside fresh produce are the various seasonings used in northern Thailand. Northern Thai meat dishes often include dried spices, so bundles of makhwaen (prickly ash, a spice related to Sichuan pepper) and baskets of long pepper and other spices are staple ingredients. Sold at the same stalls are tiny yet pungent cloves of garlic, bags of dried chilies and bundles of shallots. Flat disks of dried, fermented soybeans are a common and ancient northern Thai ingredient, as is nam puu, a bitter paste made from freshwater crabs and herbs.